Carteret County Shore Protection Office. Great Lakes Dredge & Dock Company (GLDD) finished working eastward from the submerged pipeline landing at 8th Street on Saturday (April 6), and is now working westward from 8th Street, informs the Carteret County Shore Protection Office. 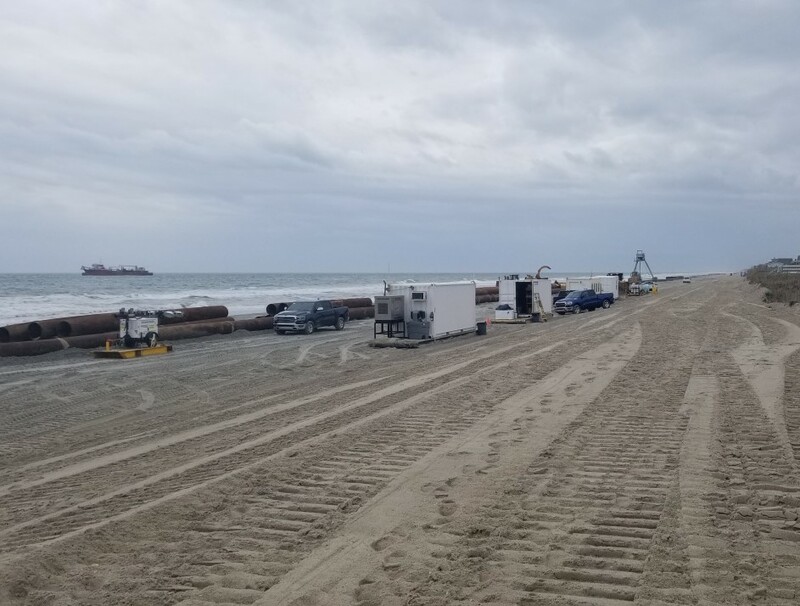 According to the County, the beachfill connecting Reach 1 in Emerald Isle to Reach 2 in Indian Beach have now been merged, the pipes have been removed from the beach. The County also added that the dredge Ellis Island was on her way from Charleston yesterday, scheduled to begin dredging/pumping later on Monday (April 8). The schedule calls for the Ellis Island to start pumping sand onto the beach near 18th street in Emerald Isle, proceeding west towards the Towns Eastern Regional Access. The Liberty Island will continue pumping from the submerged pipeline at 8th Street and work west. The Ellis Island – having the capacity of 14,800 cubic yards under optimal conditions – has been in operation since December 2017. The Post Florence Renourishment Project is one her first beachfill jobs. Overall, the Post Florence scheme in Carteret County will utilize 945,446 cubic yards of sand obtained from the Offshore Dredged Material Disposal Site (ODMDS) associated with Morehead City Federal Navigation Project. Emerald Isle (EI), Indian Beach (IB), and the unincorporated area of Salter Path (SP) will receive 617,131 cy, 271,905 cy, and 56,410 cy, respectively along 5.2 miles of shorelines. The project is scheduled to be completed by April 30, 2019. See original article . . .